General Chart of the Cost No. IV From Cape May to Cape Henry. An uncommon and highly appealing 1862 U.S. Coast Survey nautical chart or maritime map of Atlantic Coast of Delaware, Maryland, and Virginia. The map covers from the entrance to Delaware Bay (and Cape May) southwards to the entrance to the Chesapeake Bay (and Cape Henry). This area was a crucial naval theater during the American Civil War. The Union, taking advantage of its superior naval strength, was able to control the entrances to both Bays, there bay strangling the Confederate capital at Richmond. The map offers a wealth of maritime detail including countless depth soundings, identification of various rocks, shoals, and other undersea dangers, and notes on light houses, light boats, tides, magnetic variance, and soundings. 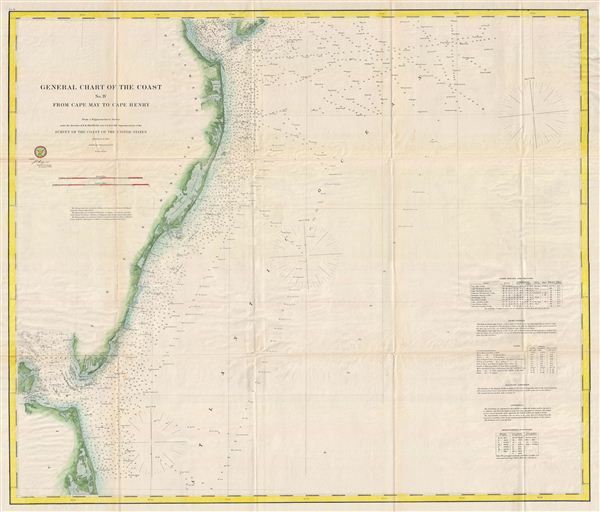 The whole was compiled under the direction of A. D. Bache, Superintendent of the Survey of the Coast of the United States and one of the most influential American cartographers of the 19th century. Published in the 1862 edition of the U.S. Coast Survey Superintendent's Report.